Established by Raegan Moya-Jones after her move from Australia to the United States, Aden + Anais was invented by way of necessity. Within the US, Raegan simply could not find the swaddles and wraps that Australian motherhood tradition praises so highly – so she started making her own. Now, her darling swaddles and baby accessories are loved my mums and dads everywhere! Make sure your little one is snug all night long with Aden and Anais’s Dreamer Single Classic Sheet. 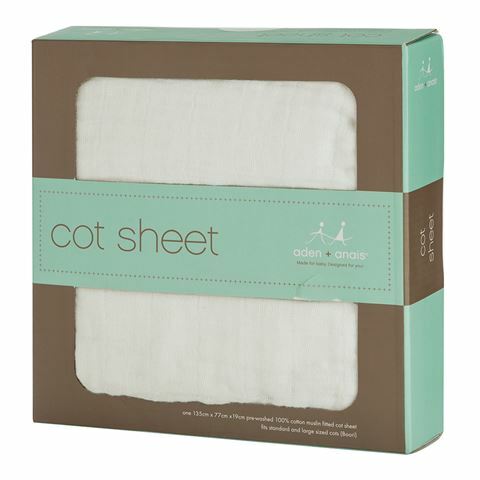 Soft, breathable and kind to skin, this cot sheet is designed to provide babies with the comfort they need. It’s tailored to fit snugly on standard cot mattresses and is durable enough to last you for a long time to come. Make sure every night is dream-like for you and your baby. Year-round comfort – warm in winter, cool in summer. Open weave allows for airflow. Tailored to fit snugly on standard cot mattresses. Presented in an Aden and Anais box. Dimensions: 135cm (l) x 77cmm (h).